I've been dying to try the Clarisonic Mia for the longest time. I was so intrigued by a vibrating skincare brush that claimed to clean out my pores. How could this be? I wondered. Wouldn't it be bad for my sensitive skin? On the contrary. Upon my first use of the Mia, I was completely and totally hooked. After plugging it in for the requisite 24 hours to charge completely (trust me, it was hard to wait! ), I took it into the shower with me -- it's waterproof, you see! -- smoothed the accompanying Gentle Hydro Cleanser over my face, and turned the Mia on. It slowly swirled and vibrated over my face as I wondered what my skin would look like. WOW. I suffer from pretty intense blackheads across my nose and chin -- usually they're so deep and dark, it looks like I have freckles -- and THEY. WERE. GONE. Not to mention my skin looked and felt 10 times better and softer than 5 minutes earlier. Dryness was reduced, pores were clear, I felt like a new woman! My one side note -- it does feel a bit strange, especially on your nose. Not quite ticklish, but the vibrations really do feel weird! 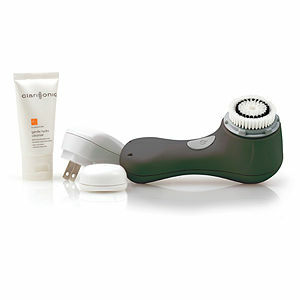 The Clarisonic Mia Skincare Brush retails for $149 at beauty.com. Now I really want this (except for the price, darnit)! Nothinnggggggg works to get rid of my blackheads, and it's the biggest skin care problem I have yet to solve.